Entered into 12 th week of my FFF series with another interesting breakfast recipe.Check out the ongoing series Cooking with Family-Family Food Friday and if you have missed any of the previous posts in this series,check them here. Kharabath is one of the most famous breakfast items in all Upahara Darshinis in Bengaluru and generally it is paired with sooji halwa/kesaribath and is called 'Chow-Chow' bath which is a real satisfying breakfast.Most of the south Bangaloreans would be familiar with 'Brahmin's coffee bar' in Shankarpuram which caters excellent Idlis,wadas and Kharabath and superb coffee,if you are in Bangalore don't miss to try this joint.My S-I-L is a huge fan of this joint and she was quite happy with my brother's kharabath as it has tasted very similar to her favorite joint kharabath.Hence they named this Kharabath as 'Brahmin's Coffee bar style - Kharabath'.We do not know their trade secret for the recipe,this is an attempt to re create the taste of Kharabath which we get there and we are happy with the taste. For people who are not familiar with kharabath let me tell you more about this.Kharabath is a closer cousin to regular rawa upma with additional ingredients and lots of ghee which gives a silky soft and melt-in-mouth texture to it,but taste wise it is no where compared to upma.Even if you do not like upma the moment you taste this you would be surprised with the texture and taste of it and also fall in love with this simple humble breakfast.Kharabath is generally served with coconut chutney and that is an excellent combo,so do make coconut chutney as well when you are making kharabath,they are like match made in heaven.The pictures did not do at least half the justice for the recipe,but believe me just follow the recipe blindly and you will have wonderful silky soft kharabath in front of you in minutes. Dry roast rava until the aroma starts and turn light brown in color, cool it. Heat 3 tbsp of ghee in a kadai and add cashew nuts and fry them till it turns golden brown and keep it aside. To the same kadai, now add mustard seeds and let it crackle. Now add jeera, chana dal and urad dal and fry until light brown. Add chopped green chillies,curry leaves and fry for few seconds. Now add finely chopped onions and fry until they turn light brown in color. Add chopped egg plant and fry it for a couple of minutes. Add finely chopped beans, capsicum, peas, tomato and cover it and cook for 3-4 min. Now add ginger-garlic paste and cook until the raw smell is gone. Add turmeric, red chilli powder, salt and garam masala to it and cook for a minute. Meanwhile boil water in a separate container in the ratio(1C rawa:4C water) until it bubbles. Add boiling water to it in the ratio of 1:4 (1- semolina :4-water) and cover it and let it again come to a boil. When the water bubbles add semolina by continuously stirring it. Cover it and cook for 2-3 minutes on low flame until semolina is completely cooked. Add lemon juice to it and mix well. 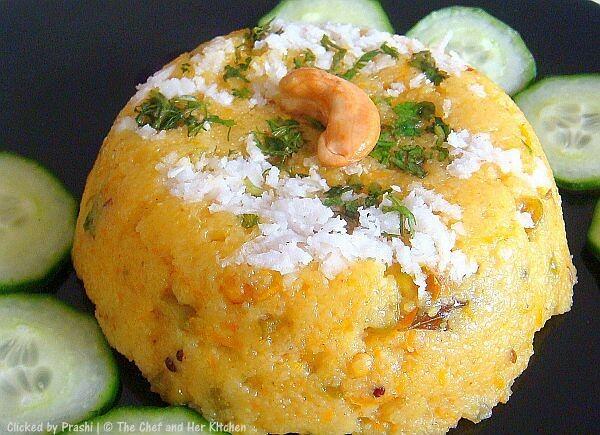 Garnish it with chopped coriander and grated coconut and fried cashew nuts and serve.Add a tbsp of ghee on top before serving. 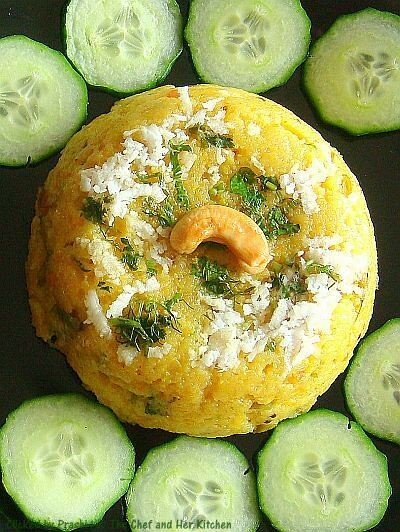 Serve it hot with green coconut chutney and sliced cucumber. This is made up of ghee completely,however if you want to reduce the quantity of ghee you can use ghee and oil in equal parts and top it with an additional tsp of ghee.But the liberal usage of ghee gives the kharabath a special texture silky soft and nice aroma and taste. This is the plate decorated for my 2 yr old niece and hence named 'Bunny Kharabath'.She was so excited to see this and tried to pick up the cucumber slices from the plate. 100% true about the ghee fact in this, we love it when we eat at restaurants and want to recreate the same at hom,but not liberal in ghee means,will never get the same texture and aroma :) Loved this very much! Very yummy hv tasted at Blore.. generous ghee is not in me so i shd only taste at restaurants the pics replicates xactly Restaurant type kharabath.. awesome clicks .. perfecto!! 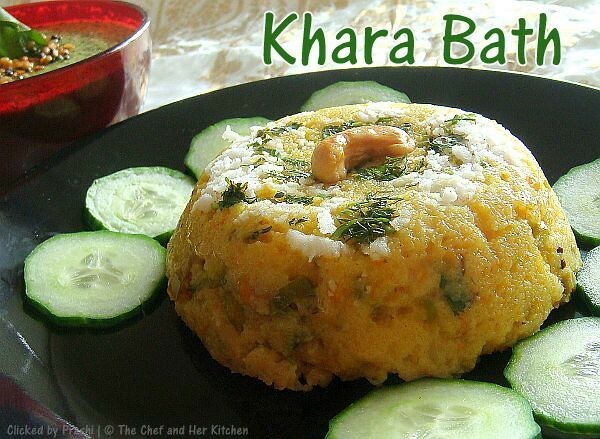 Nice cliks...khara bath looks delicious. Looks very colorful and love that presentation. I am a great fan of this. I know we can get creative with dishes but don't remember coming across kharabhat with all these veggies / garam masala. I think some versions use sambhar powder, right? kharabhath with chutney its a yum combo, infact i prepared this yesterday mrng in a similar method with a change in veggies and addition of sambar powder.One of the fav bfast u will im most south indian resturants. Thanks all for the comments..
@ Suma...The vegetables are chopped finely and added to it generally and regarding sambar powder,I believe it spoils the taste of kharabath so we never add,and also garam masala is added in small proportion to give a tiny hint of masala spice taste to kharabath..Do try this version once if you would like to. We made the essential trip to Brahmins cafe when we were in Bangalore last time and gorged on idli vada and kharabhat. I have bookmarked this recipe to try soo. Just back from blore & tasted chow chow there...And this looks even better than the blore darshini version!!! I dont ever want this family recipe series to end!! Loved the avalakki paddu too :) I love these traditional recipes with a twist..And yes, generous addition of ghee is what gives it heavenly taste!! You have a very talented brother. This is a very new dish for me but am ver tempted to try it out as it looks so delicious. Wow!! Prathibha, this looks yummy. I love this a lot. A perfect breakfast dish. My fav bk home, looks delicious and nice clicks. Oh my that looks so tempting. ghee does make a difference. 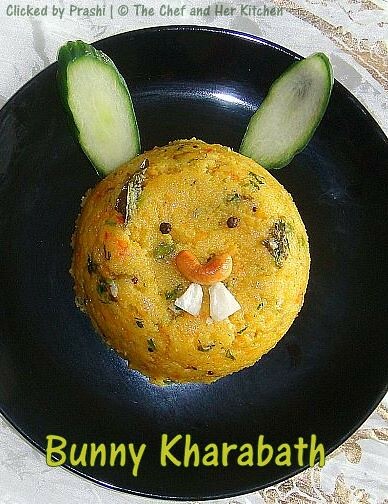 kharabath looks excellent, nicely presented, bunny kharabath looks so cute.. WOW!! This is so interesting!! I need to try it out soon! Thanks for sharing! Very true, I agree with u, ghee makes it richer and more tastier..Love the bunnay shaped plate..Superb recipe. Prathy, this looks super delicious. Since I am on vacation and travelling a lot not able to catch up with all your posts. Remembered yesterday was Friday and was able to get hold of an internet connection and glad to see this lovely dish. With all the goodness of vegetables this sounds awesome breakfast yaar..Yet to do my breakfast but you are not letting me to go anywhere. I wish I could have this right now !! Greatly presently and looks so tempting. Love your recipes, keep them coming! 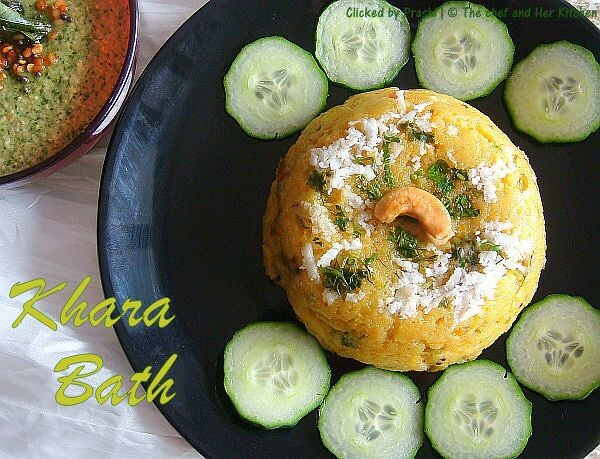 Love this kharabath recipe..looks mouth-drooling!! Delicious kharabath and nice presentation. wow..Both recipe and presentation are wonderful!! sounds yum! looks very delicious..the pictures are great!! Yummy irresistible karabath a fav of mine. It looks yummy already what more if i have this for real. Ive tried it once and i admit its taste cant be forget easily. I was looking for a good Khara Bath recipe and this totally fit the bill. Thanks a lot, for this keeper of a recipe. This is the first time i'm writing on a blog eventhough i have gone thru 1000's of recipes on diff blogs ! trust me, u ROCK ! :) \m/ i tried karabath for the 1st time, n it came out sooooooo well....! my husband simply relished it :) thank u so much for the wonderful luscious recipe ! @Preethi..Ur comment made my day!! Thanks for letting me know that u liked it.. I made this for breakfast and it turned out soooo goood....thank you for sharing this tasty recipe.keep up the good work. Ginger garlic paste to kharabath? Are u kidding me? @anonymous..ginger garlic paste definitely makes the Kharabath taste better..but if you want you can skip garlic in the recipe,this recipe has been tried by many and got appreciated as well. Even I am not a ghee person..but I loved the pic. I ate Khara bath several times at Brahmins coffee bar. I always relished it and wondered if I can make it at home. Today, I just searched and found this link and tried it. It came absolutely wonderful and almost same like the original one. My wife too relished it and complimented. Just missed the Chutney. Hi Prathy, I can't thank you enough for posting the Bangalore Darshini style Khara Bath...I have been looking for this recipe on the net & tried a few times but nothing ever came close to the standards these joints have set, esp Brahmin's! Which is why I am thrilled to say that your recipe hit the bullseye with the Darshini flavour & taste. I have made it a couple of times now & it comes out fantastic! Thank you and your brother for the perfect recipe for Khara Bath..I hope to pick up many more recipes from your website. I will let you know how that goes..in the meantime, happy blogging and thank you for sharing these beautiful recipes with us readers. hello mam! first time on your blog. i have tasted chow chow bath in bangalore. but never dared to replicate at home..now that i have come across this very detailed recipe. i think i will :) thanks a ton! Thanks for the detailed receipe. Tried it exactly as you said and it came out yummy. Tried the recipe, came out very very well :) loved it.. Thank you so much for this.